Throngs of people, eager to get a jumpstart on the warm weather, head to the beach in this rite of Spring. The highlight of the weekend, along with brunch or dinner, is the annual Cape May Easter Parade. The tradition of wearing new clothes at Easter time goes back to the 16th century, according to Wikipedia. Spring is a time for renewal and what better way to show it than by putting on a new bonnet. 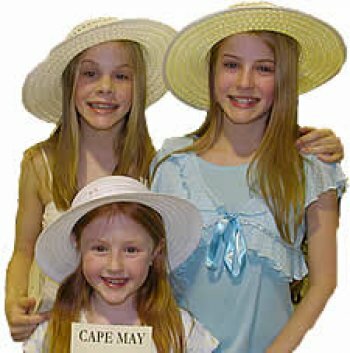 For years, families in Cape May paraded inside the Star of the Sea auditorium, showing off their spring outfits. This year, weather permitting, fashionistas will march in grand style on the Washington Street Mall. Judges will have the unenviable job of picking winners in a variety of age groups and among the adults as well. The parade starts at 1PM. If you’d like to take part, get there by noon to register. It’s free and all are welcome. Saturday seems like the officially designated egg hunting day. Little ones from preschool age to 2nd grade can search for eggs at the Cape May Elementary School on Lafayette St. starting at 10AM. There’s also an Easter egg hunt at Cape May Point State Park for little kids starting at 10AM. Older kids – ages 6 to 9 can take part in a beach scavenger hunt while their little brothers and sisters are looking for eggs. In Wildwood, there are two egg hunts Saturday at noon: on the beach at 17th Avenue, North Wildwood for children 11 and under and on the beach at Lincoln Avenue, Wildwood for children up to 12. Congress Hall is hosting two Easter Egg hunts on their lawn on Sunday, at 11AM and again at 1PM. Both are open to the public. Sunday at 12:30PM, children 12 and under can search for eggs on the the boardwalk at 23rd Ave., in North Wildwood. Food is always a centerpiece of any holiday. Several restaurants are doing prix fixe Easter Sunday brunches – starting around 10 or 11AM. Make sure to make reservations early. Many other restaurants are serving Easter dinner – some starting a little earlier than usual. Again, make reservations. This entry was posted on Saturday, April 11th, 2009 at 3:33 pm	and is filed under Uncategorized. You can follow any responses to this entry through the RSS 2.0 feed. Both comments and pings are currently closed.